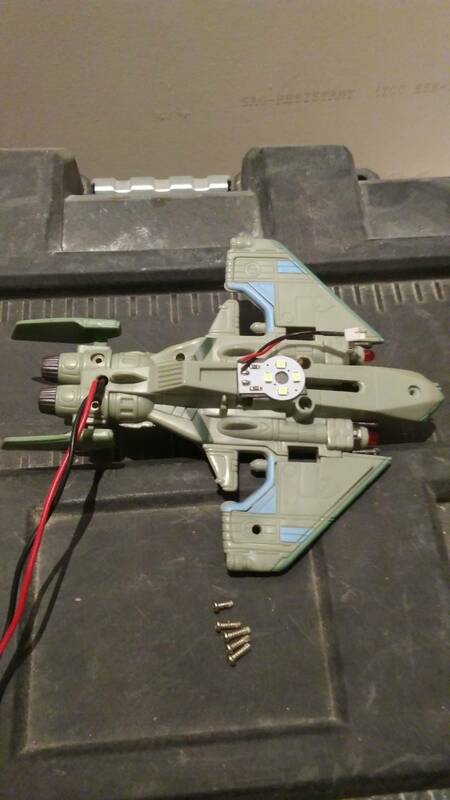 Here is a mod that I did to the TAC fighter toy on SST. 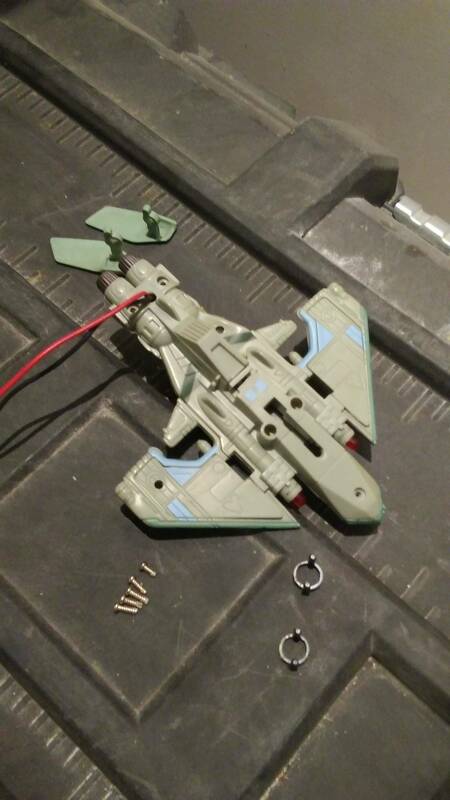 I removed the plastic missiles from the toy along with the springs and trigger. 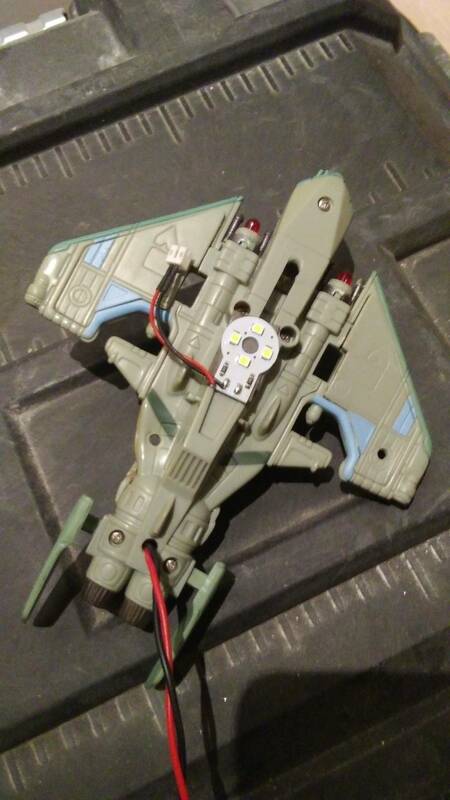 I retrofitted it with a couple of LEDs in place of the missiles and soldered into the ramp flashers so that when you shoot the right ramp, instead of just the flashers underneath the ramp lighting up, it looks like the ship is firing off a volley of missiles too. I also attached an LED strip to the bottom of the ship and tied that into GI (you'll see in the pics) but that's not associated with this post. Step 1: remove the ship from the play field. Step 2: remove all the screws from the bottom of the ship. There should be a total of 5. Step 3: CAREFULLY pry rings off of each of the missiles. My toy had a ton of super glue all over it and those rings didn't want to come off. You'll probably have to break the glue seal to get them off. Hopefully you won't damage them in the process. You can see mine sitting off to the side in a couple of the pics so you know what you're dealing with. Step 4: Also Carefully pry the bottom half of the ship from the top half. You'll have to break apart more glue joints at this point and you'll notice the missiles and all their internal mechanisms breaking apart. I didn't try to save any of my internal components. I was more concerned with what the top outside of the ship was going to look like when I finished. 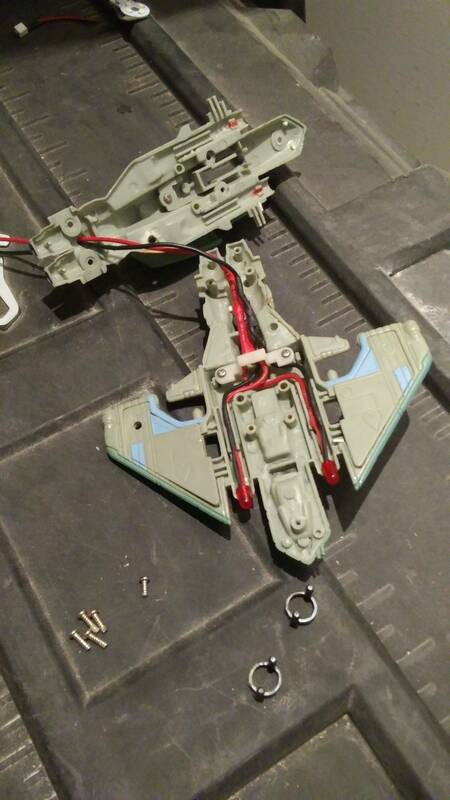 Step 5: once you've removed all the internal parts for the missiles, drill a small hole in the bottom rear of the ship and feed your wires through. I used about 18" of wire for this. Just enough to feed through to the bottom of the play field for a splice in case I want to pull the ship off for some reason without removing the solder at the flashers. Step 6: don't forget your heat shrink! Step 7: solder a 2" to 3" piece of wire to each of your LED leads and then heat shrink the leads. Step 9: if you forgot your heat shrink in steps 6, 7, or 8, feel free to use electrical tape to cover your solder joints. BTW, I recommend using 60/40 rosin core solder for your joints. As a novice solderer, I initially didn't pay attention to the type of solder I was using and I struggled for a while trying to get my joints to flow together smoothly. It wasn't until I did some research that I realized that the solder I was initially using was garbage and once I changed to a better quality solder, the job became a lot easier. 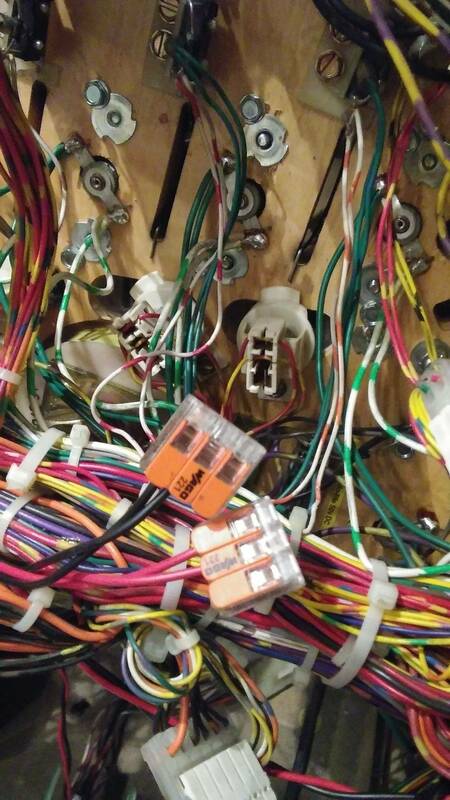 Step 10: train all your wires into the empty spaces inside the ship & reassemble it. Step 11: feed wires through to the bottom of the play field making sure they're not getting in the way of the ramps or inhibiting any movement for the ball and re-mount the ship to the play field. Step 12: solder wires to the positive and negative terminals on one of your right ramp flashers. Step 13: attach your 2 sets of wires to each other underneath the play field being sure that you have your positive and negative leads attached properly. Step 14: set up a game and enjoy the fruits of your labors! Now, every time you make that right ramp shot, you'll see your TAC fighter blasting away the bugs! Thank you for reading! This was a fun little mod for me. For the LEDs, I used Linrose super bright B4302H1 - 12V 23 mcd - 5mm RED LED bulbs. I pre-tested my LEDs before I installed them to make sure they worked and to make sure I was hooking up the positive and negative correctly BEFORE I began soldering. I hope this helps or at least gives you an idea for your own mod on a machine. Please let me know if you have any questions. Happy modding everyone! Intresing. I just got a SST and was thinking this plus leds in the flipper guns. I did the same thing except the led light under the ship, how did you deal with the higher voltage from the flash bulbs going to the leds? Yes! I'm planning on adding light mods to the gun turrets too! I want to tie them in with the small flipper so that when you hit it, the guns flash along with the machine gun sound. I'll make another post if I get around to it any time soon. If you were thinking the same thing, be careful tying into the high volt power for the flippers. Not all LEDs are rated to handle that voltage. 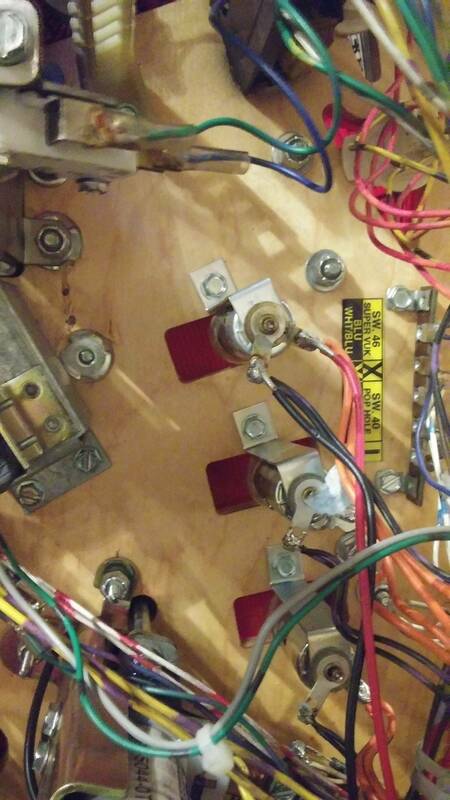 I suppose you can wire into the flipper switch instead of the coil but I haven't dug too deep into it yet. I just used 12v rated LEDs. 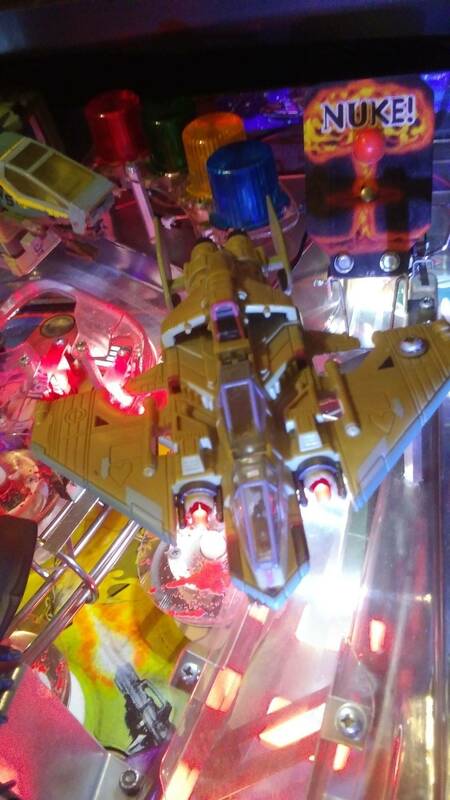 Another interesting look is the blue lights on the head that turn on for live fire mode. The last mod I can think of is adding UV paint to the warrior bug and putting a UV led to shine on it when live fire mode. Would pop the yellows and such. Ok after searching around, it seems the toys used in the game where off the shelf toys. And the fighter ship came with two crew members. 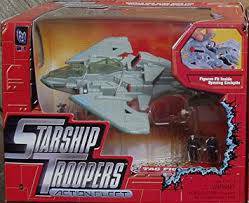 So sega never put the people in the ship but glued down many parts. So sega had alot of extra pilots laying in a box at the factory. Ha! yes, I noticed that too. I almost ordered an extra ship off ebay when I was taking apart my play field ship because I was having trouble un-gluing it and almost broke it. I almost bought more bugs too to add to the play field. It's pretty funny that they just grabbed a bunch of these toys to populate the game. It worked out well, I think.